John Ordover recently wrote about Surfside Beach, South Carolina declaring itself an autism-friendly family vacation destination. In April of this year, John, his wife (TPGA editor) Carol Greenburg, and their 13-year-old autistic son Arren spent a week in Surfside Beach, and had a blast. This is his report on their trip. On landing in Myrtle Beach airport after an uneventful flight, we were met at the gate by Becky Large of Champion Autism Network (CAN). Becky is the person who had pushed for Surfside Beach to make its commitment to hosting autistic families in the first place. 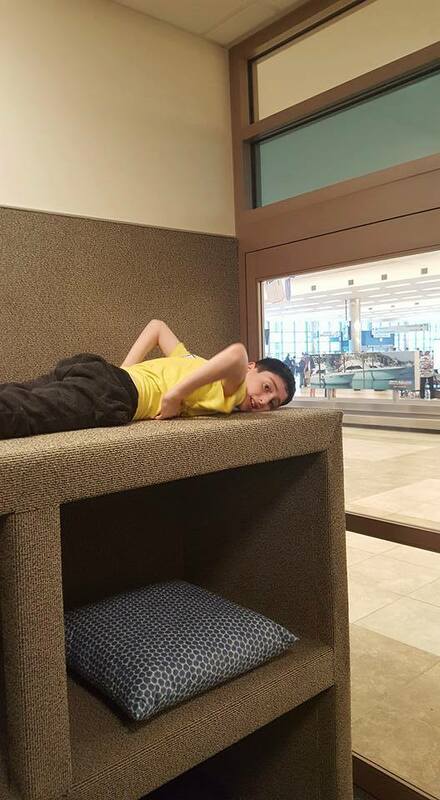 Becky took us to the lovely small airport's special waiting room for autistic kids who might need some chill-out time. Arren took to it immediately and enjoyed snuggling into its cubbies and nooks specially designed to calm kids and give them pleasant sensory input -- plus a way to shut out the rest of the world if need be. Becky then walked us to our rental car, and sent us off to our hotel, where our room was all ready for us. Arren has a long list of ways in which any hotel room has to be prepped for him: all drinking glasses replaced with paper ones, any coffee-makers removed, and the back of toilet tanks taken off. Holiday Inn Surfside nailed every single item, better than the Disney hotels and five-star places we’ve been to. Becky also set us up with a mother’s helper named Veronique who has many years of experience working with autistic kids. This was not a free service, but Veronique was the perfect person to help us with our stay, and she was worth every penny. Arren’s needs were covered six ways from Sunday. We chose Surfside Beach not only for its promise to be welcoming to autistic kids, but because of how well it matches up with what Arren enjoys: There was a pool right outside the back door of the hotel. The ocean was only a few steps farther and the beach uncrowded, and Arren loves the waves. He’s water-safe, so with Veronique there to help him in the ocean, our only real concern was that he would decide to swim off with a school of passing dolphins. 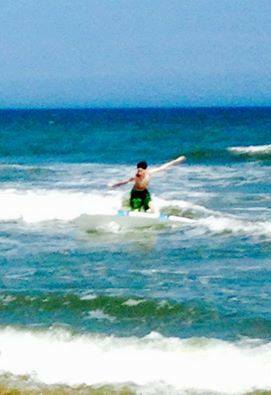 After lunch, and thanks to arrangements made by Becky and CAN, Arren had surfing lessons. He had just started learning to surf back home, and loved it, so getting daily lessons was ecstasy for him. The surfing instructor was engaged to an autistic woman and treated Arren like gold -- while pushing him to learn and excel. After surfing, Arren hit the treadmill and the weight machines in the hotel work-out room, with Veronique joining him in running and pumping iron. 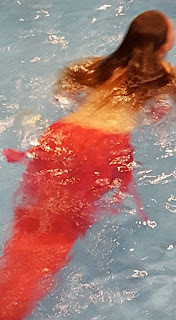 Then it was time for dinner at the Calabash Buffet Seafood House for all-you-can-eat crab legs (and plenty Arren did eat) with Becky and her family -- to see their real live mermaid, whom Arren found absolutely fascinating (before you ask, mermaid is not on the menu). We went back to our hotel room to find that, since fireworks are legal in South Carolina, people were setting off some really cool amateur displays on the beach -- and Arren could see them from his window. Arren is a sensory-seeker, so fireworks are maybe his favorite thing in the world, which means our generally happy kid was even happier than usual, and went to bed with no trouble. On our last night we even bought a bunch of fireworks and, with the help of Becky and her husband Mike, we took them down to the beach and -- Arren got to set them off himself, to his great delight. “At Surfside Beach, Becky had already sensitized staff at the airport at the hotel and at the various restaurants to look for signs of autistic meltdowns or shutdowns, so when I started to feel overwhelmed there was always somebody right at hand to help me find what I needed. Because everything Arren loves was within a hundred feet of the hotel, we didn’t get to see much of the surrounding area. But we're going back in September, and look forward to hitting more of the local attractions such as Radical Ropes, Brookgreen Gardens (particularly good for sensory avoiders), and fishing on the pier at Myrtle Beach State Park, which is soon to be autism-friendly as well. We also may hit a dinosaur-themed miniature golf course that my wife had been to as a child. It seems like no matter what you or your kids’ needs are, Surfside Beach and the nearby area has something that will suit you. After all, shouldn’t every restaurant have a mermaid?